With a storyline as epic and sweeping as Star Wars, there's a lot of changes. 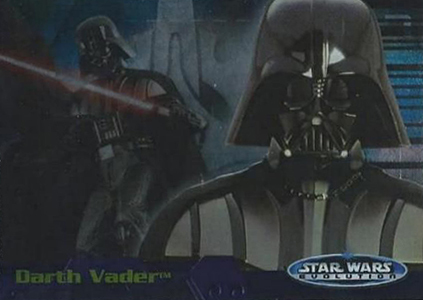 That's the theme of 2001 Topps Star Wars Evolution, which documents the transformations of key characters over the course of the first four films. 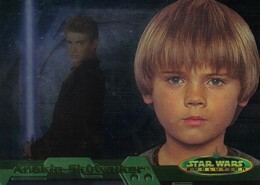 While the concept was interesting enough to revisit a few years later, perhaps the bigger draw of the set is the first autographed Star Wars trading cards, at least when it comes to actors. 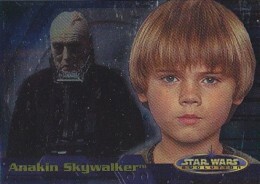 The 2001 Topps Star Wars Evolution base set has 90 cards, all of which are character-focused. The right side has the main image, a portrait. On the left, somewhat faded out, is a second shot. Backs offer a character description. Like all the cards in the release, they're done with foil card stock. Two basic inserts are essentially an extension of the base set. Evolution A (12 cards, 1:6 packs) and Evolution B (eight cards, 1:12 packs) take key characters and show how they changed over the course of the first four films. They have the same general design as the main set. 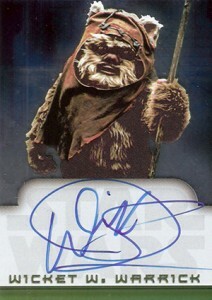 2001 Star Wars Evolution is significant for offering the franchise's first actor autographs. While the early Star Wars Galaxy sets had redemptions for artist autographs, these aren't as iconic as landing a Carrie Fisher or James Earl Jones signature. Autographs combine to land 1:36 packs or one per box. However, there are several tiers of short prints. Many of the biggest names, like Fisher (Princess Leia), Anthony Daniels (C-3P0) and Billy Dee Williams (Lando Calrissian), are among the toughest to pull. This also leads to higher prices on the secondary market. The set has a total of 25 autographs. Done at a time before stickers, they're all signed on-card. 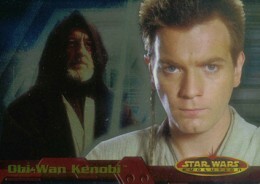 Topps revisited the Star Wars Evolution concept with an Update set in 2006. 12 cards. Inserted 1:6 packs. 8 cards. Inserted 1:12 packs. 25 cards. Inserted 1:36 packs. Insertion Rates: Level A - 1:37 packs, Level B - 1:919 packs, Level C - 1:2,452 packs, Level D - 1:3,577 packs. 2016 Topps Star Wars Evolution Factory Sealed Hobby Box - 2 Hits Per Box!